At a very young age, Björn Frantzén and Daniel Lindeberg caused a massive stir in the Scandinavia when they received their second Michelin stars within two years of opening their restaurant in 2008. 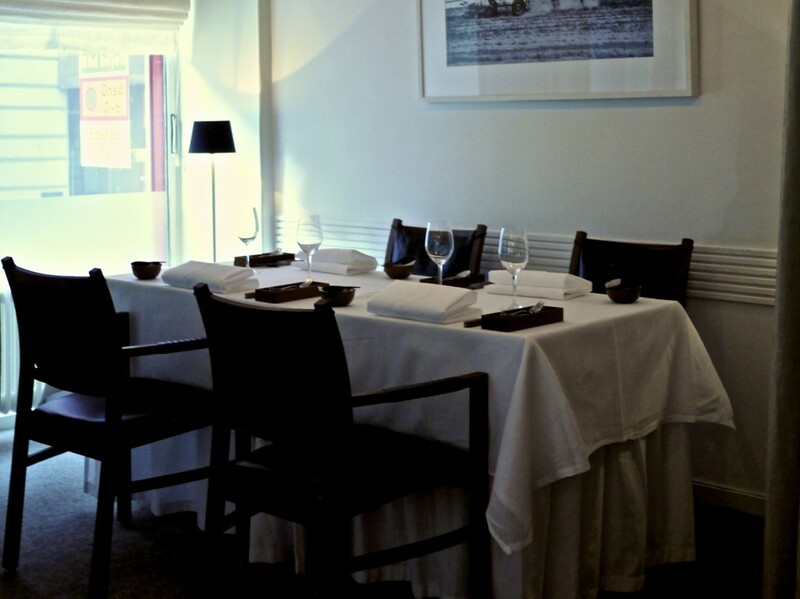 Their success followed immediately as they jumped from “One to Watch” to a staggering 12th place in San Pellegrino’s 50 Best Restaurant Award in 2013. 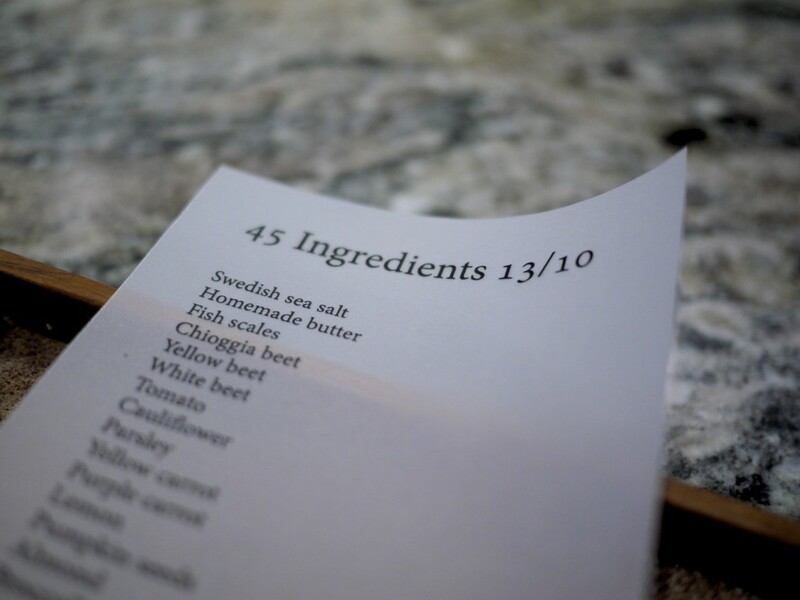 Having had some mixed experience in Stockholm between an extremely successful meal at Oaxen Krog the year before, and subsequently a rather disappointing yet expensive dinner only the night before at Matthias Dahlgren’s Matsalen, I wasn’t qute sure what to expect. I was however assured by the local food blogger Enfoodie that I had nothing to worry about, leaving me with his final words – prepare to be amazed. Update Note: Daniel unfortunately parted a little while ago to pursue other dreams of opening a bakery, hence the name change, but Björn on the other hand has further expanded his portfolio to also include a wine bar (Gaston) and gastropub (Flying Elk). In a very bold move, the restaurant had just finished their renovation work in order to expand the kitchen space at the cost of the dining room! Suffice to say, with a capacity for less than 20 diners, getting a table here was no easy feat but not only did we manage to get a reservation, we also got to sit at the kitchen table allowing us to interact with Björn and Daniel, and observe everything that was going in the kitchen. The menu comprised of a prologue, followed by four chapters that ended with an epilogue. Following a quick introduction and briefing of our meal, Björn wasted no time in putting the final touches to our Prologue which consisted of six beautiful bite size amuse bouches with sensational flavours and textural contrasts starting with a Carrot macaron with liver and tarragon, followed by Blood pancake with liver and compote of with lingonberry and beetroot, Spelt brioche with roasted garlic, dried butter and crispy chicken skin and a rather delectable airy Beef from the bullock “Chubai” aged 46 months on lichens. 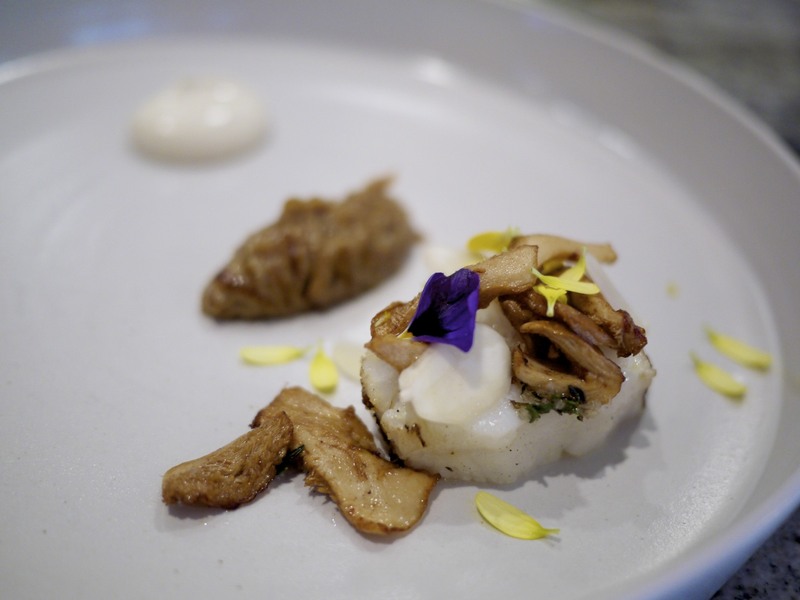 The Pig’s head with shellfish emulsion served on pork rind with vendance roe from the Persson Brothers and Vichyssoise with truffle and ash both sounded like bizarre combinations but they worked extremely well. What a phenomenal start. 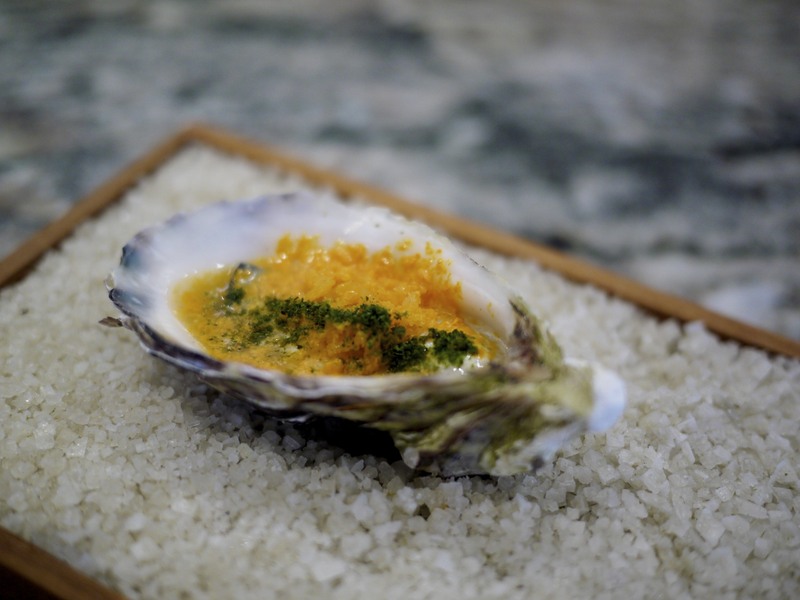 Chapter 1 began with an Oyster that had been sealed and poached at 62 degrees, served with some creamy jersey cream, crunchy frozen buckthorn and fragrant dried seaweed. 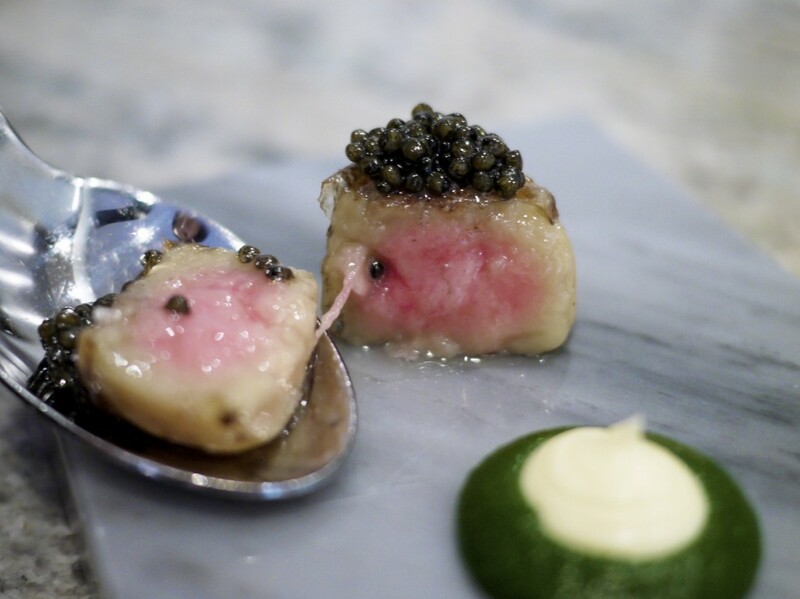 The intense flavour of the oyster was outstanding with a perfect touch of acidity from the juniper berries. A very clean taste of the ocean. 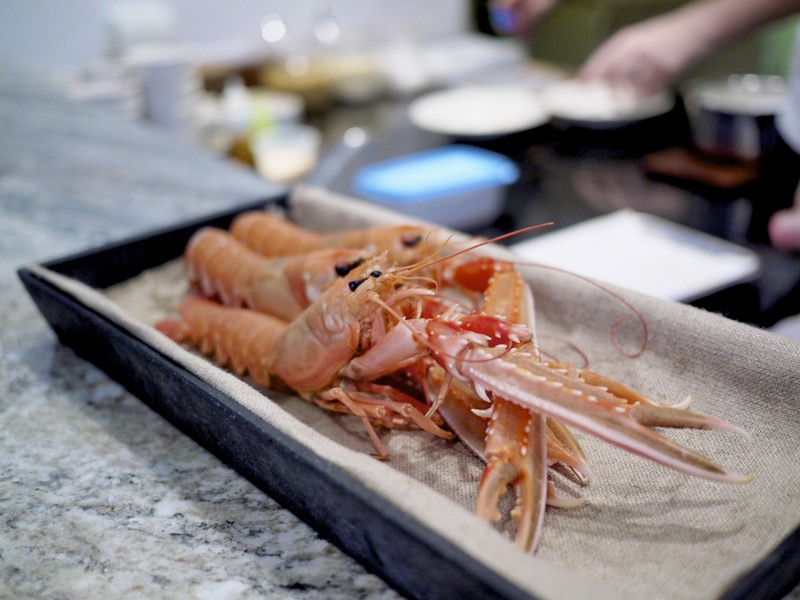 Björn then brought out a few live langoustines to really show off the quality and freshness of their produce. To his point, they needed to be kept alive until the very last minute to retain the moisture and natural sweetness of the langoustines. After taking away of live crustaceans, he wasted no time in plating up the next course incorporating the langoustine… but where was the langoustine? 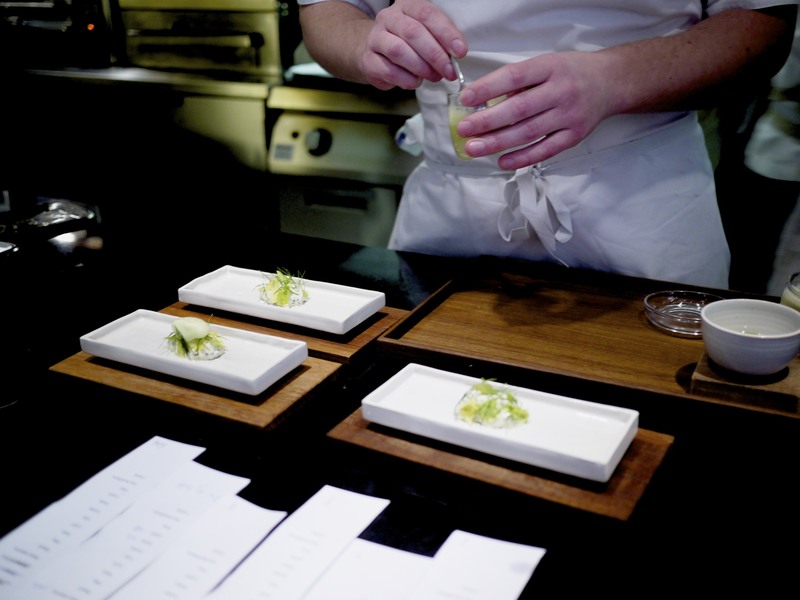 The Langoustine had been prepared as a tartare and topped with fennel oil, caviar and diced granny smith apple. Good seasoning and a light fruity acidity to cut through the sweet crustacean. 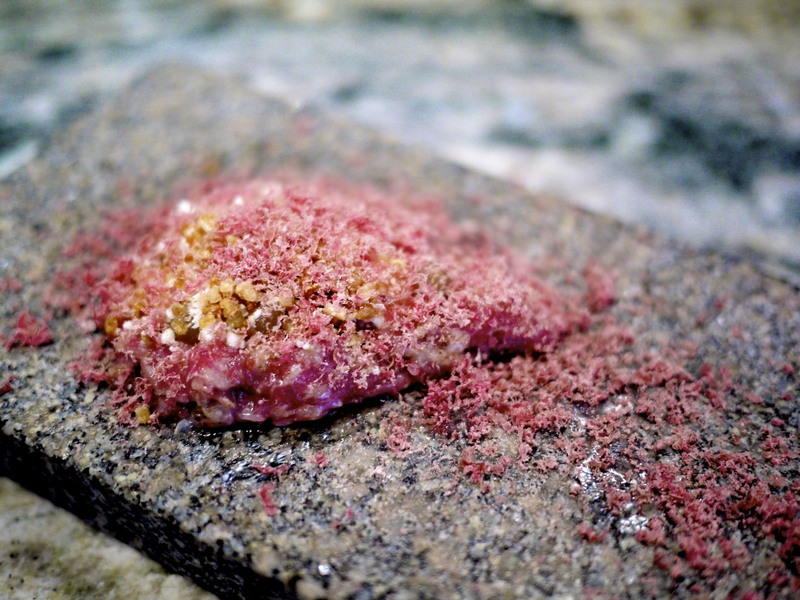 I was particularly impressed by the fact that this dish was even more amazing than the set of amuse bouche. 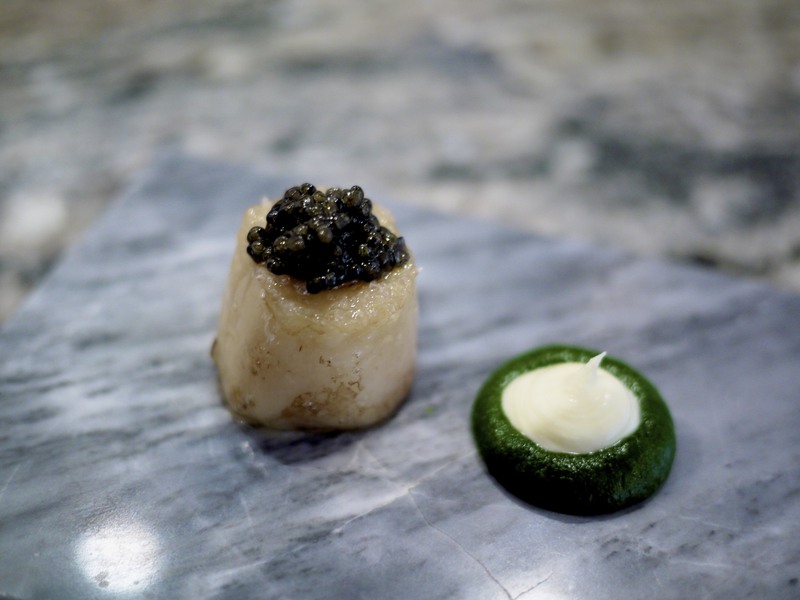 Another bold and confident move in serving Bone marrow topped with Osetra caviar and a smoked parsley purée on the side. 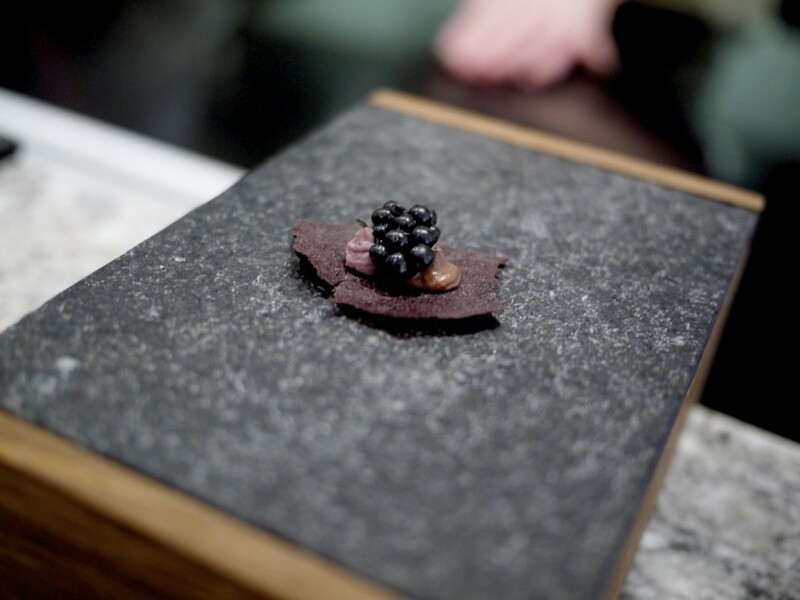 You could see the rays of confidence shining from Björn when he served this to us, and he was right to be confident. It was bloody good. The bone marrow was delicately soft and rich and it’s flavours extracted with the salty black caviar that was the seasoning component on the dish. 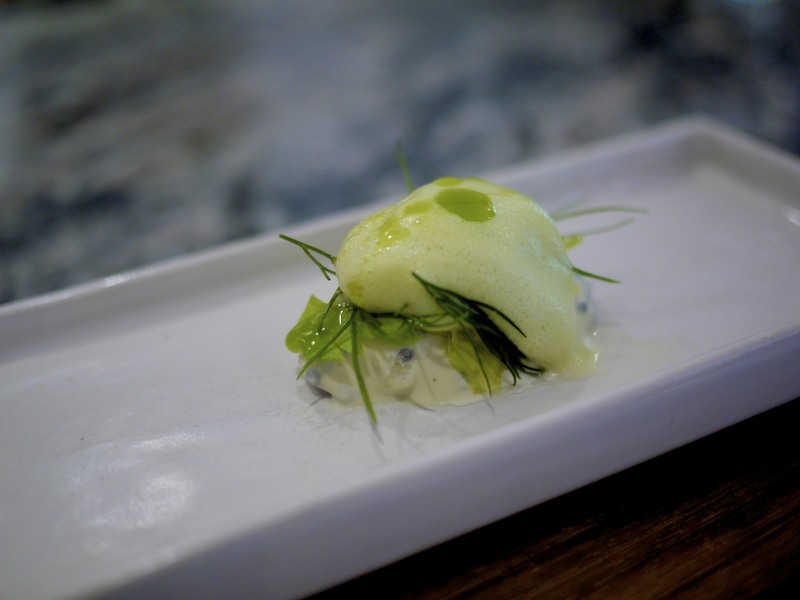 The parsley purée added that crucial herbaceous freshness to lift the dish from being too oily. This was seductive food and I was in love. Our 2nd Chapter commenced with some manual labour. Björn had churned out some butter for our crackers. 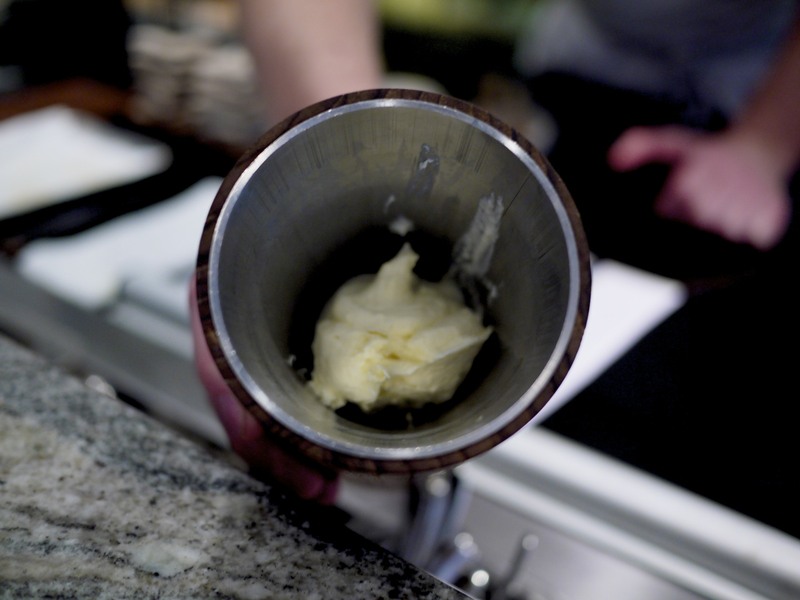 He added milk fat that had been prepared under vacuum, sucking out the milky water and proceeded by churning it. Very clever! 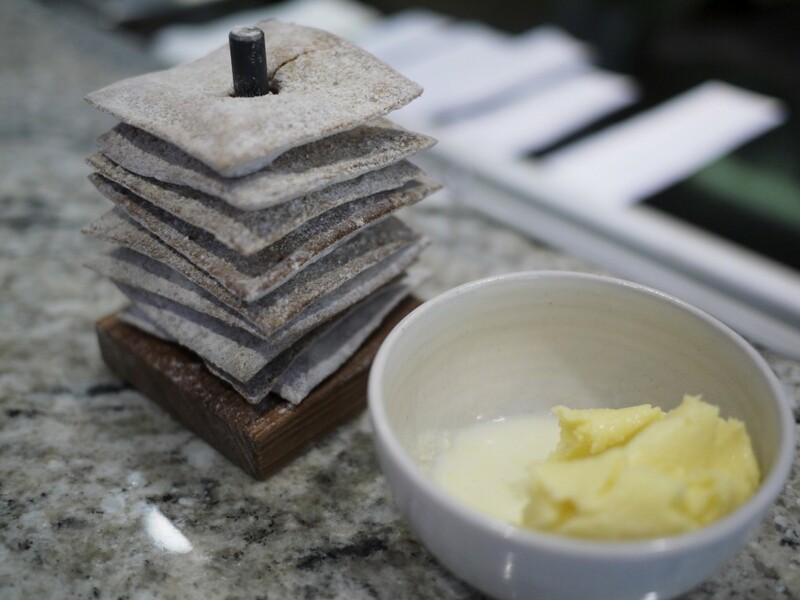 He served the creamy butter with Björn‘s take on Knäckebröd which were traditional Swedish crackers that date as far back as the vikings! 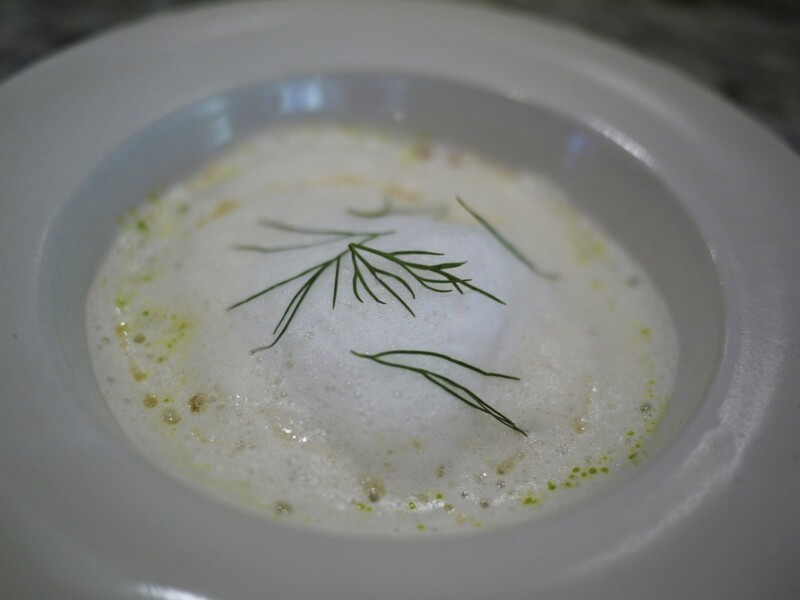 The kitchen continued to produce stunning dishes one after another including the King crab legs soaked in beer and crab shell broth and small cubes of pike, garnished with some dill. The buttery crab was packed with flavours and handled with respect and care. Could this get any better? 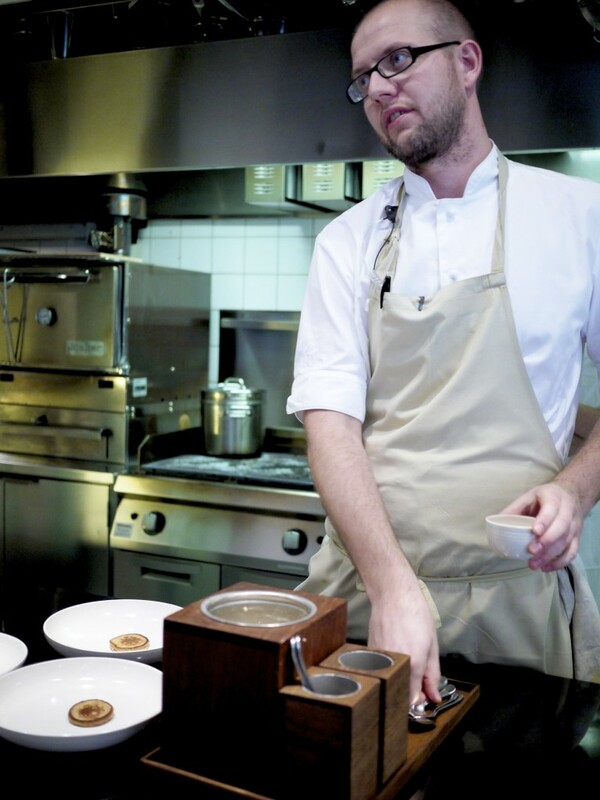 The Show of the season (Satio Tempestas) was Björn‘s way of showcasing all his seasonal produce and ingredients which changed every day depending on the harvest, but was always on the menu. With 45 ingredients being used, it reminded me of Michel Bras’ famous Gargouillou. You could also see some Japanese influence with scales from fried bream being scattered across. This was perhaps also the closest dish to Bras with many incredible flavours exciting my taste buds with every bite. 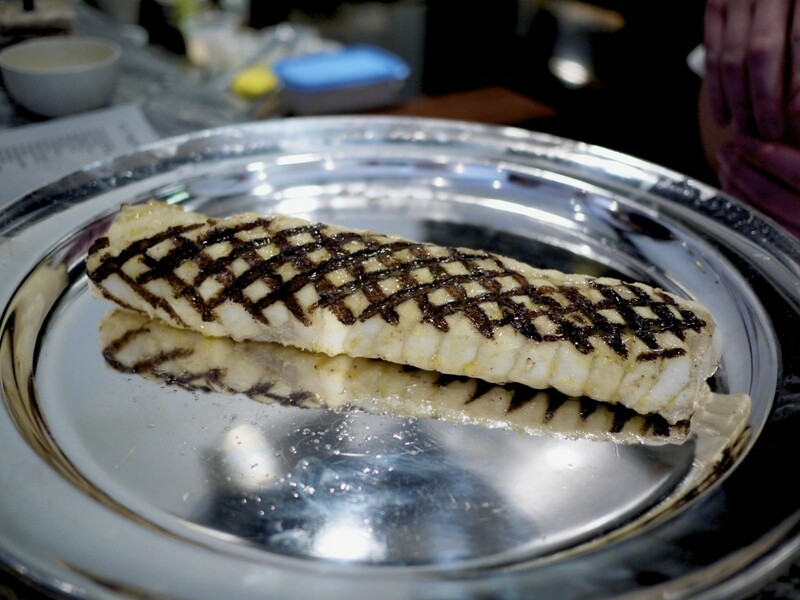 Chapter 3 was all about the main dishes and we were beside ourselves with excitement when a grilled monkfish fillet was presented straight off the grill, exerting a waft of inviting smell. Björn momentarily took the monkfish away and returned five minutes later with another knock out dish. The moist and juicy Grilled Monkfish melted in my mouth with the sweet caramelised quenelle of roasted onions with a lingering flavour of goats cheese perfumed ever so slightly with liquorice. Every component on this plate had a purpose, and amazingly worked together in achieving the goal of a perfect dish. 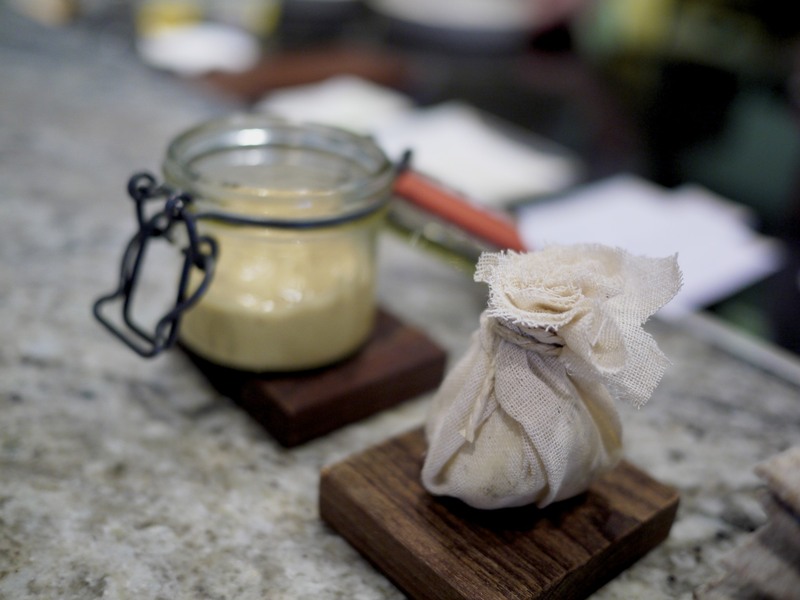 Half way through the dish we were presented with a jar of smoked brown butter and ash flavoured goats butter. We were instructed to spread the two butters on the fish. I thought at the time that this was a bit odd. Contrary to our expectation, they worked really well and in particular the smoked butter. It was so good we ate it with the remaining crackers. 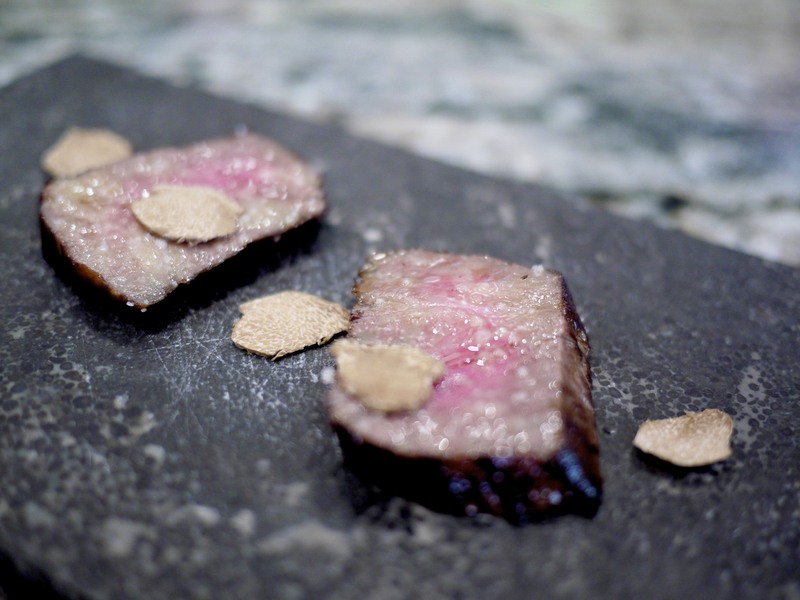 Björn then cut a couple of slices of the Beef that had been hung for 72 days and dressed it simply with a few shavings of Alba white truffle. The meat was cooked medium in order to render and melt the fat. Silence had befallen on the kitchen table as he glanced at us. The tsunami of flavours swirling around my mouth from this meat was astounding. This was on par with the beef I previously had at Ledoyen. Simply amazing. Björn then explained that the next course of the Frozen carrots and grapefruit with pink pepper and olive oil was a palate cleanser for the finale of the savoury course. It certainly cleaned up any lingering flavours with the acidic and tart sorbet followed by the heat from the cracked pink pepper and bitterness from the olive oil. 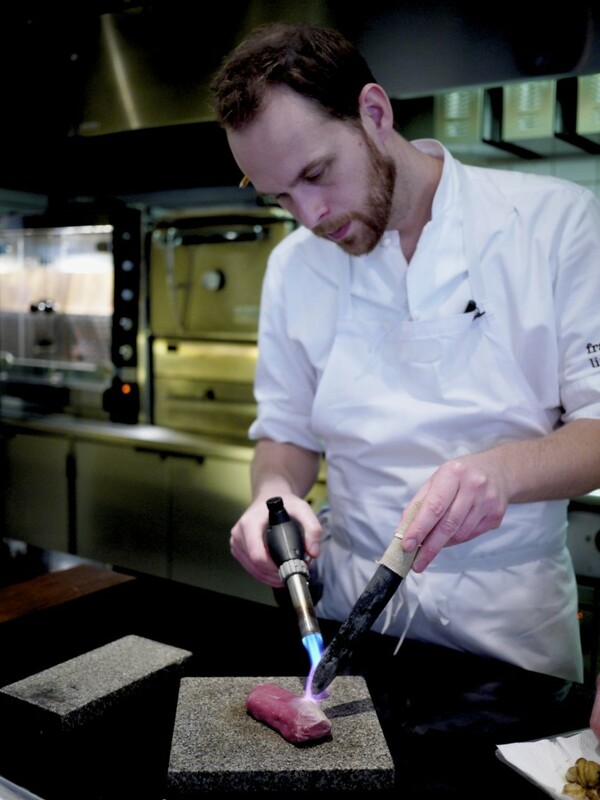 Björn then took out a his blow torch and binchotan to smoke the outer layer of this lamb as a final preparation for the Two servings of lamb from our own breed. The first of the two servings was a bed of Lamb tartare with salted goast cheese, sheep yogurt with dried lamb brisket shavings. This was another winner. Having never had lamb tartare before I found the meat extremely delicious with a good level of fat, and the dried lamb brisket was packed with concentrated flavours. Simply stunning. 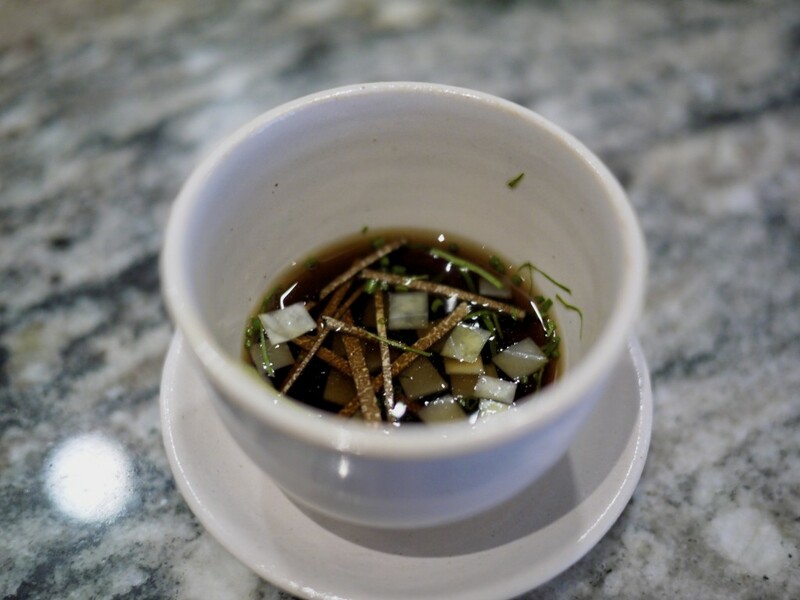 A shot of Cabbage consommé before the next serving. The second serving was Seared lamb served with roasted cabbage and onion, finished with a butter sauce and shavings of white truffle again. Simple, flavoursome and the bonus was of course the truffle. 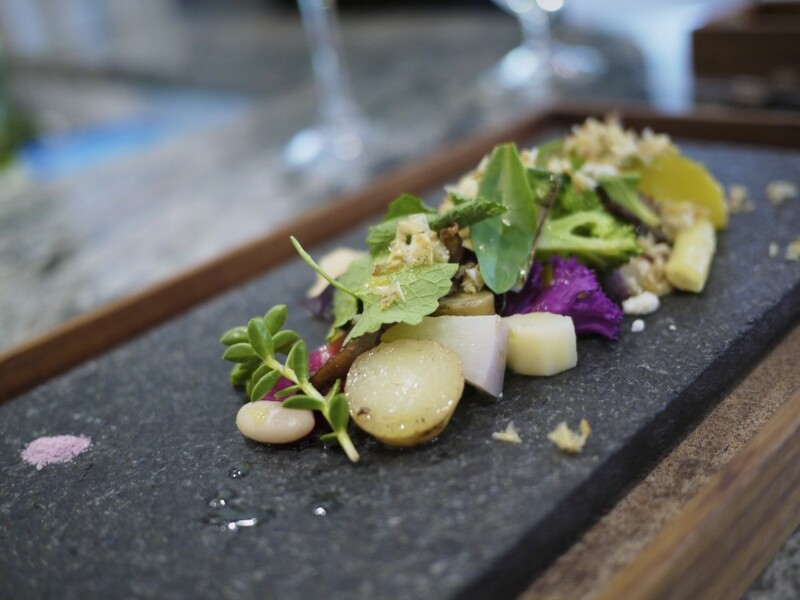 Seldom have I had a flawless meal where everything had been executed perfectly whilst delivering sensational flavours that were truly concocted by a culinary master. 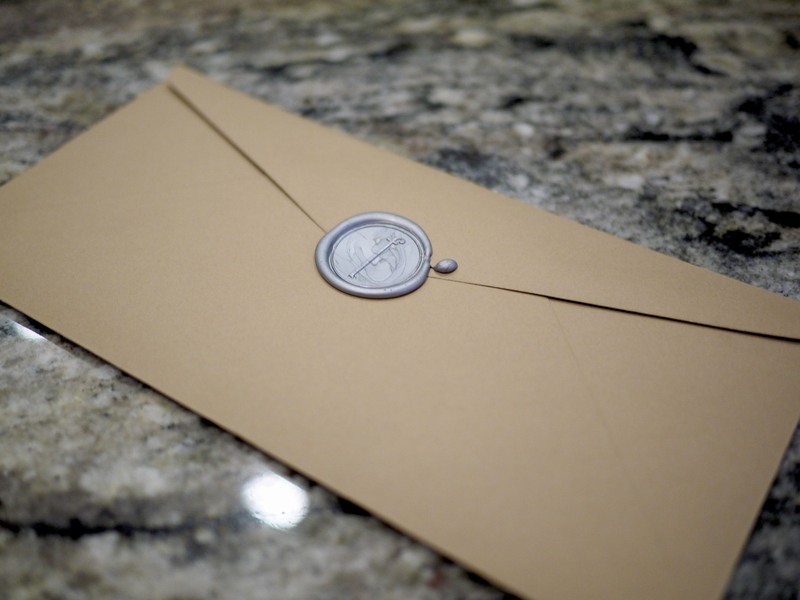 It was now Daniel’s turn to deliver the final Chapter and Epilogue. 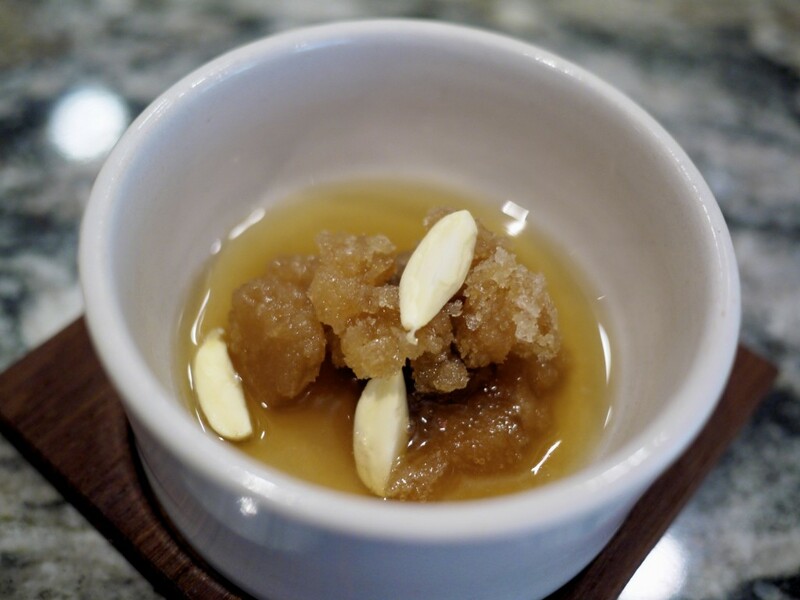 The first dessert was a perfect transition from savoury to sweet with the very well balanced Oxidised pear granita, hazelnut emulsion, sea salt, braggot mead and Welsh honey wine. Daniel then went on to explain that a coherent menu was cyclical, tying back the flavours to the beginning. 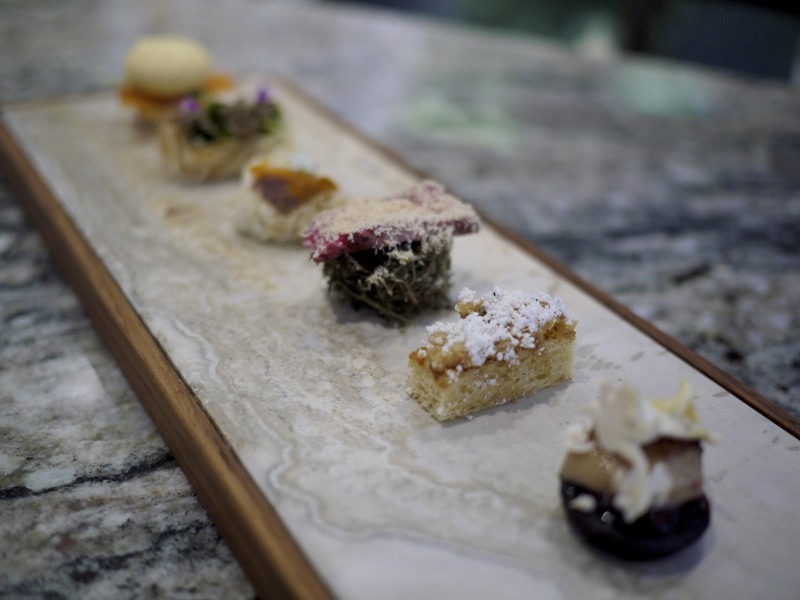 Dessert should not be all about sugar and sweetness but rather the ingredients and flavours. Interesting! The second dessert was a celebration of Cloudberries. 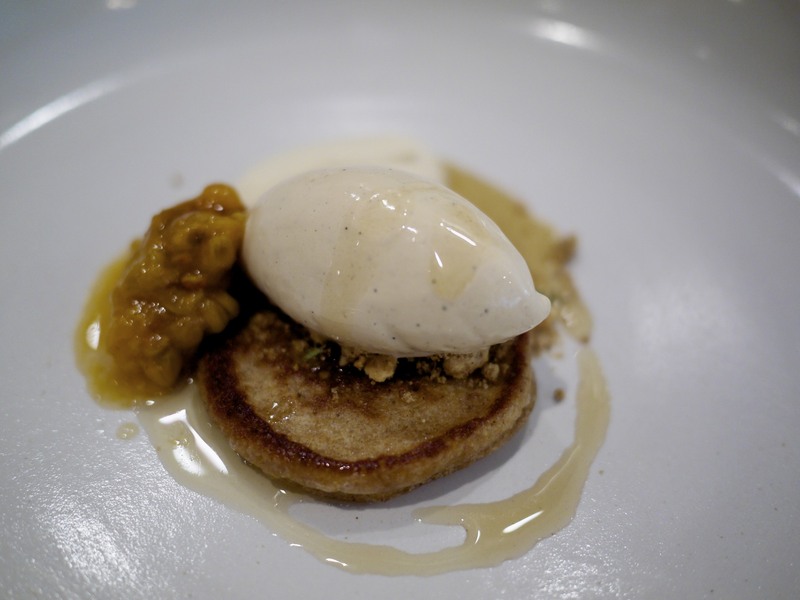 A quenelle of cloudberry and vanilla ice cream was served on a pancake made from cloudberry seeds, served with a compote of cloudberries on the side. 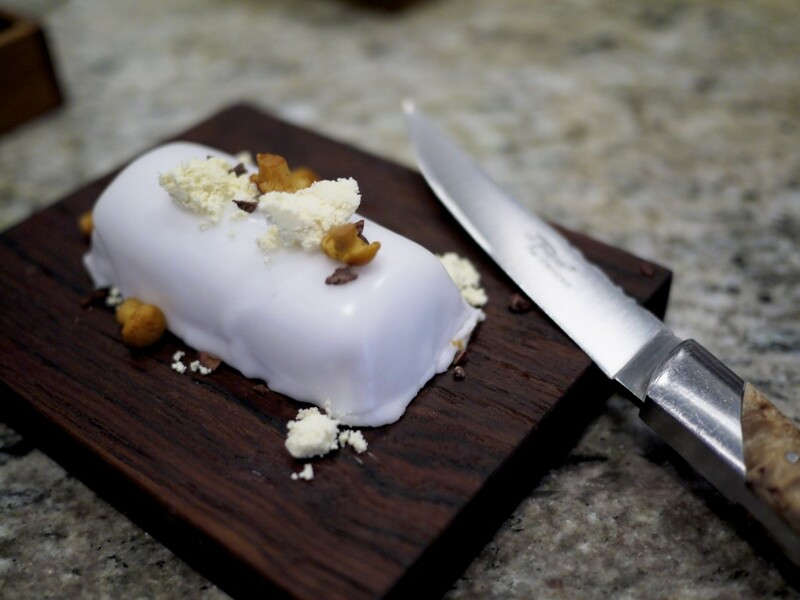 The finish was a drizzle of maple syrup and roasted white chocolate. Guess what? Sure enough, you could taste cloudberries and it was surprisingly not too sweet. 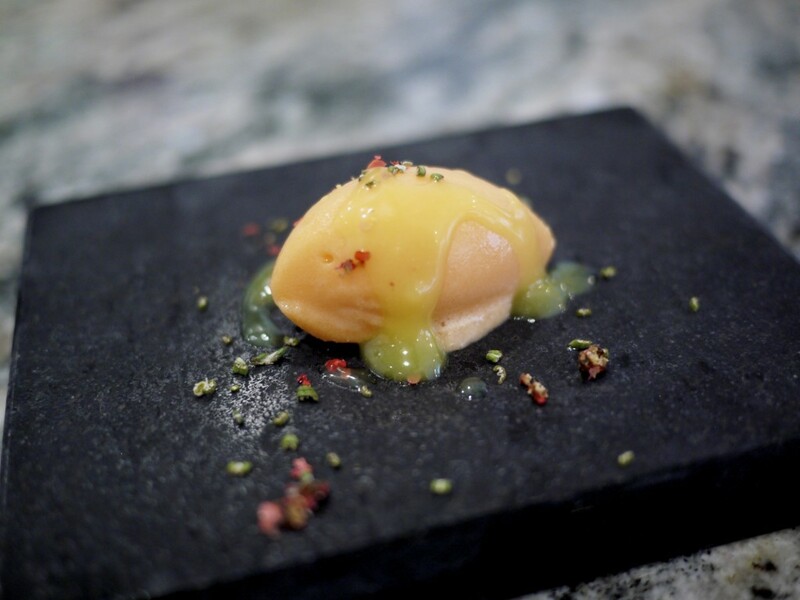 One of my top three favourite dessert ever was the Sea buckthorn sorbet resting on oolong tea mousse with matcha green tea meringues and brittle crystalised sea lettuce. 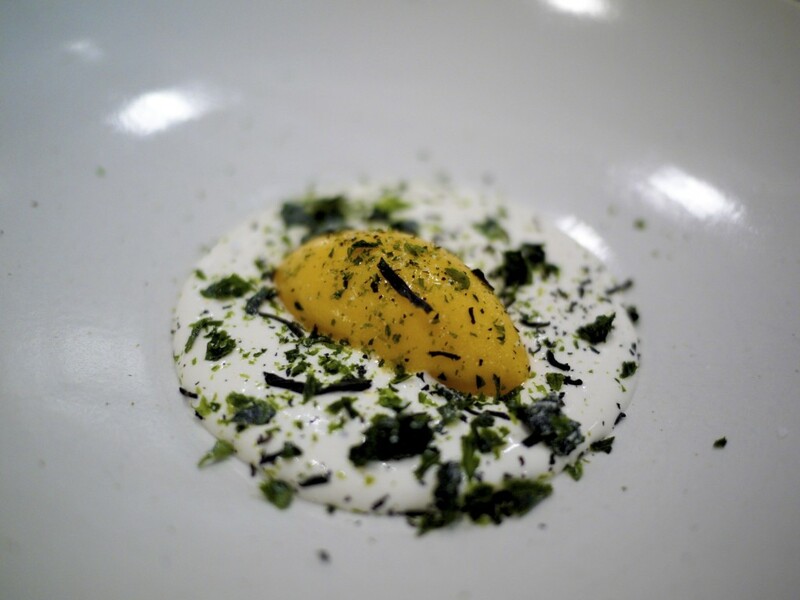 The salty sea lettuce magnified the marriage of flavours between the acidic sea buckthorn and the aromatic mousse. Just when you thought the tartness of the sea buckthorn was too much, the sweetness from the mousse hit your taste buds. The cycle continued with every spoon. It was as if my tastebuds had died and gone to heaven. 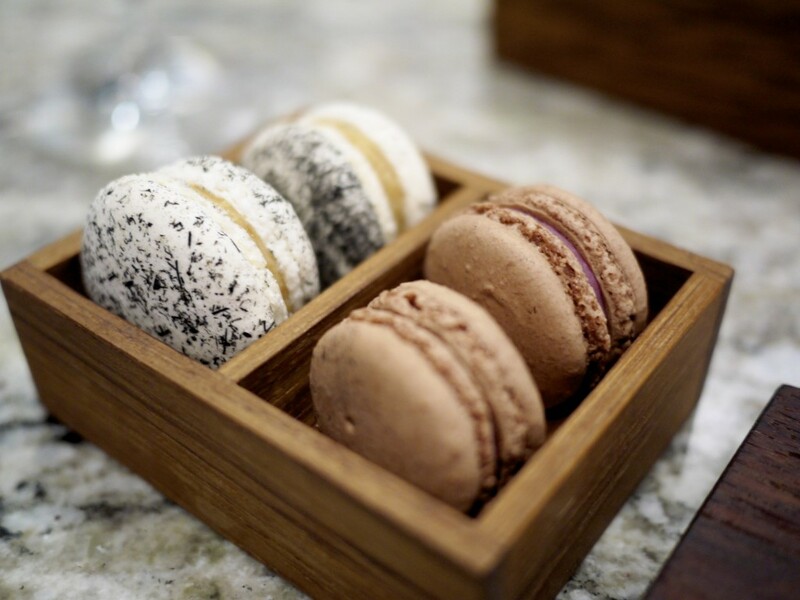 Two types of macaons as petit fours. One was salted caramel with tar and hay ash, and the second one was bitter manjari chocolate with arctic raspberry ganache. Fondant of glazed apricot and girolles biscuit garnished with rapeseed oil powder. Dried pig’s blood disc with a cream made from pig’s blood, blackberry, and bitter chocolate. I have no doubt that the cooking here was on par with some of the best restaurants in the world in the last five years, making Michelin’s two star rating rather a mockery and an insult. 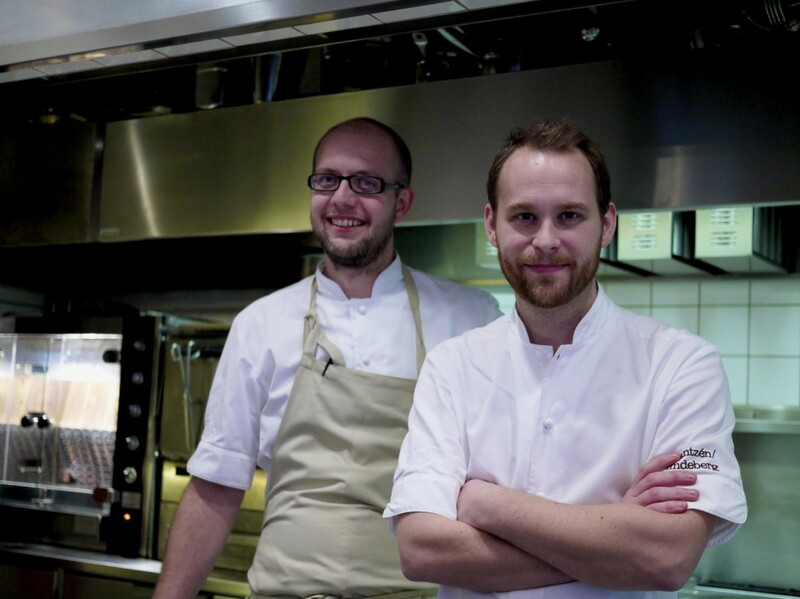 Björn and Daniel clearly belonged in the three star rating and could certainly hold their own with other big hitters like El Celler de Can Roca. 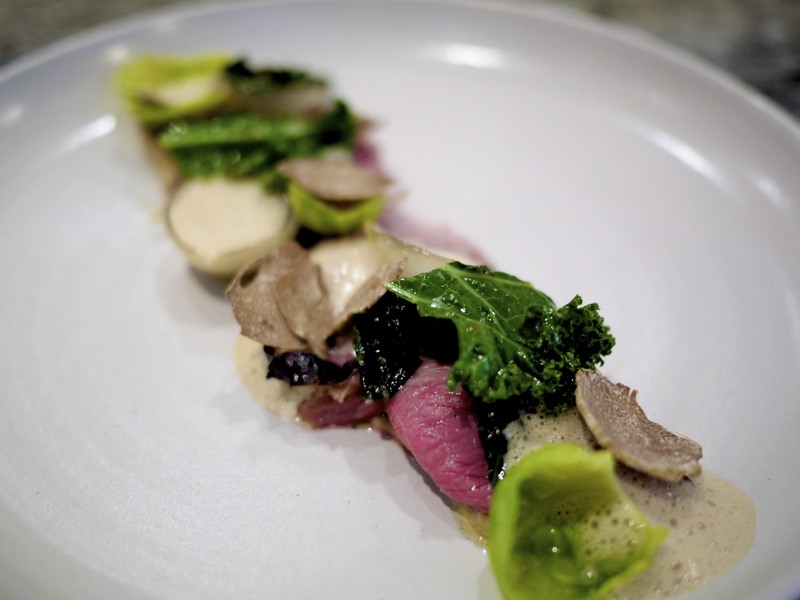 The bonus here was also that it was affordable when you compared to other places like Matthias Dahlgren (where I dined the night before and left underwhelmed) and Oaxen Krog. After all, who can throw in mushrooms and pig’s blood into their petit four and make them tasty? 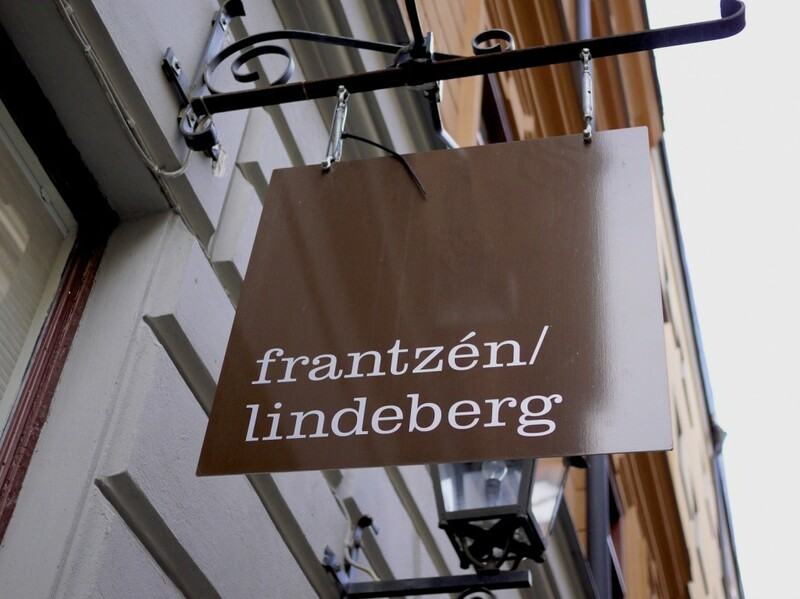 This entry was posted in Sweden and tagged Bjorn Frantzen, Daniel Lindeberg, Frantzen, Michelin, San Pellegrino, Stockholm, Sweden on May 24, 2014 by admin.